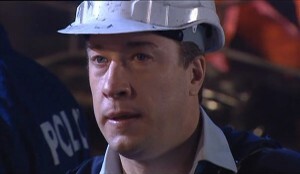 Stuart finds Sindi in the burning building and starts to carry her out as we see the building collapse. The Lassiters complex is a wall of flames, with silhouettes of firemen rushing around. You hear disembodied radio voices, sirens and then a helicopter. Behind a 'Danger' tape, we see the residents, silently watching - Lou, Karl, Toadie, Harold. Toadie is ringing Sindi and just getting her answer machine. He asks Lou and Harold if they're sure they didn't see someone come out. 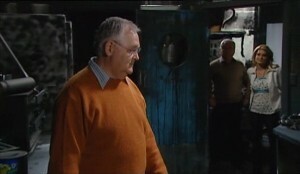 Lou replies that they would have heard by now and Toadie nervously asserts that Stu's pretty quick on his feet and he's sure he would have found somewhere safe. . .
Steph is wandering around nervously as Doreen says that someone should ring Valda. Lyn begins to dial but pauses and says she doesn't know what to tell her. She asks Steph to recount exactly what happened that evening. Steph says that he was happy; they talked and Doreen wrote a letter to Valda for him, gave him some pills...Michael reacts and asks how many. Steph says it was just two, a little early, but he was in pain and asked for them. Doreen emphasises for Michael's benefit that it was just an hour. Steph goes on to say that suddenly everything felt different - although she was holding him, she felt alone and he'd just slipped away. Lyn hugs her, but Michael looks away, stony-faced. The flames are gone now and the site's bathed in an eerie dark blue light, with firefighters and other emergency personnel rushing round securing and moving things. 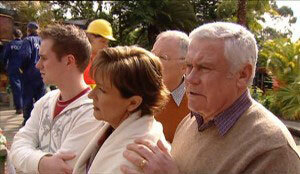 Toadie's agitated and complains to Harold and Lou that these people are just standing around like idiots. Despite protests from the two men, he rushes off to confront Steiger, telling him that Stuart could be in there. Steiger insists that if anyone's in there, they'll find them but they can't use heavy machinery or search as the whole place is too unstable. STEIGER: We have to be realistic - I don't want to get your hopes up. TOADIE (yelling): Why don't you do something! Steiger says that if Toadie wants to help, he should get behind the line. Harold and Lou lead him back, while he yells 'Why does it seem as if people are giving up on them? Doreen hugs Steph as Charlie's body's carried out and tells her to go to Max. Karl adds that she shouldn't rush - he's fine. Karl says he has a problem - he can't sign the death certificate at this stage as there are some aspects of this case that he needs to refer to the coroner. Michael asks if he's sending him for a post mortem and Karl replies that he is. Doreen protests that there's no point having a post mortem when they all know Charlie died from emphysema. Karl adds that he's professionally obliged and he's concerned about the quantity of painkillers Charlie consumed before he died - and other factors Michael has raised. Did Charlie ever express a wish to die before his time? Lyn insists that this is stupid; her father died of natural causes. Toadie's just leaning on a rail watching. Lou and Harold ask him if he's heard anything yet but he hasn't although he's tried their mobiles again. Steiger is organising a listening device and comes over to tell Toadie to hang in there. They're not in the cellar yet as it's buried under a minefield, but they're doing everything they can as fast as they can. Karl tells Det Skinner it was chronic emphysema. Questioned, he says it would have killed Charlie but he'd have expected him to last a few more weeks - not months. He's asked about the pills and says Charlie's prescription was for four hourly tablets and he understands he might have taken a few extra in the last few hours. He concedes they were given to him by 'the grand daughter'. He tells Skinner that yes, they make you sleepy but if you take too many you stop breathing. Karl replies that it seems unlikely. 'I know Steph Scully - it's not in her'. Steph comes in and says Max is OK and asleep now. She asks Detective Skinner what's happened. He apologises and says he'll be as brief as he can, just some questions. Michael says aggressively that he knows what happened - Steph killed his father. She gave him a bunch of pills and put a pillow over his face. 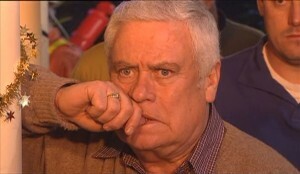 He saw what happened and so did Lyn. Lyn has hr arm around Steph as he walsks off after repeating - she killed his father. 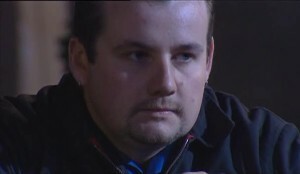 Toadie's still watching when he sees they've found something. He rushes to Steiger, who sighs that they've found a body. Lou restrains him as he yells that he wants to see it, he has a right to see it. Toadie screams 'Is it male or female?' but there's no reply from Steiger. Toadie screams that there's someone else - it's not one of them! The site is still being cleared as residents look on. Susan asks Toadie if there's any news and he answers that there's an unidentified body under the rubble but it's not Stuart or Sindi, but someone else. Harold and Lou talk about the tragedy until Toadie tells them to stop the doom and gloom. Susan asks if she can takes him home but he won't go. When Connor tries to say that Sindi might not have been there at all, Toadie insists that Sindi and Stuart are in there and they're both safe. While Toadie insists that they don't know for sure, Steiger says that although there are some parts of the cellar they haven't searched, they have to be realistic - it doesn't look good and the odds are down to pretty much zero. Toadie begs and begs to help as they extract the first body, until Steiger gives in and says he can come in with him, but he has to stay close and do everything he's told. 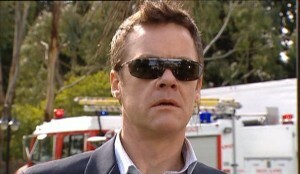 Paul Robinson gets out of a car and just looks. Outside the emergency personnel are cleaning up, while inside Izzy, Lou and Harold pick through the charred ruins of the Coffee Shop and talk about the insurance. Harold's really down, thinking of all the work, but Izzy's very upbeat and trying to see it as an opportunity - a reason for a whole new lease on life, a new beginning, a facelift. Harold's just giving her a hug and saying she never ceases to amaze him when Paul comes in. LOU: Good grief! Paul Robinson! HAROLD: Well look what the cat dragged in! PAUL: Hey Lou, Harold. Oh what a shocking homecoming. Lyn is anxiously telling Doreen she doesn't know whether she can call the funeral director. She doesn't know what they can do as the police don't tell her anything - all they have are these stupid accusations. Lyn has a flashback of her view of Steph moving the pillow from Charlie. Paul has been telling Lou, Harold and Izzy about his life. Five years in Brazil made him realise that he was just kidding himself - he was never going to amount to anything unless he came back to Australia and turned himself in. They gave him three years, during which he read the classics, got stuck into a teaching degree and turned his life around. It was the hardest thing he's ever done, but he came out the other end a better man. Izzy can't believe that the old one was so bad, but Paul suggests the other two will confirm it. HAROLD: There was room for improvement, yes. Lou asks him what he did after prison. He went into business - legitimate property development this time and got himself some 'solid earners'. Lou tells him he did a stint in prison himself - nobody's perfect. Paul takes that as a huge vote of confidence and goes on to say that he's made some mistakes he regrets but he's paid his dues and he owes the community. Paul feels the Coffee Shop and pub were the heart and soul of Erinsborough and they should get them going again in a makeshift form as soon as possible. He's prepared to carry all expenses but he wants to remain anonymous. All three agree that it's a very generous offer they can't refuse. There's darkness and we gradually hear Sindi's cough and voice. She struggles from under some debris and sees Stuart's hand dangling above her. She reaches up to grab it but can't at first until she moves up further and asks him to wake up, to talk to her. He answers but in a very groggy voice. She starts to panic but he tells her in a faint voice to calm down. In the lounge, Det Skinner is questioning Doreen, who agrees she was in the house at the time of Charlie's death, but asleep so she heard nothing that might relate to Charlie's death. Doreen tells him the investigation is inappropriate - Charlie was dying and the fact that he died at peace and not months later in great pain is actually a blessing, not a reason to hang onto poor Stephanie. DET SKINNER: ...who seems like a very nice person..
DOREEN: Yes, all of that. Det Skinner goes on to say it must have been very hard on all of them, but Doreen explains that they'd learned how to manage the physio and pain relief and hopefully that made it a bit easier for him. DET SKINNER: Is it possible that he just decided to slip away, to take a few more tablets and drift off? Det Skinner points out that Charlie couldn't have done it on his own - he'd need help to get some water, open the pills. Could he have asked a caring compassionate grand-daughter? Is it possible Steph did exactly what her uncle thought he saw her do? Lyn sees her flashback of Steph again. Doreen asks 'What if he did? What if Steph did decide to fulfil the request of a dying man? Det Skinner tells her he thinks her niece should get a good lawyer. Lou and Harold want to go as they're all exhausted and there's no hope now. Susan and Connor agree it's hopeless and think they should go home and phone everyone Sindi knows. Steiger yells as some big sections of the building threaten to collapse. Stuart and Sindi can hear voices and yell for help. Outside, Toadie is sobbing when his phone rings and he sees it's Sindi. She tells him they're trapped in the cellar. She tells Stuart that they know they're down there, but there's no reply and she yells his name as we see his unconscious face.